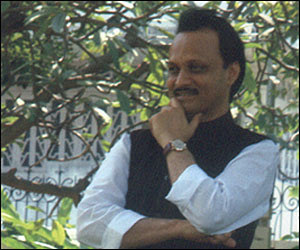 After resigning from his post of Deputy Chief Minister of Maharashtra, Ajit Pawar said that he would continue to serve people of Maharashtra and society-in-large by joining as a sweeper to Mumbai based Old Age Home. "Yes I want to work as a sweeper and collect and clean the garbage, whatever old people make in the old age homes. That is how I decided to serve people in Maharashtra. This will continue to keep me in work and do social service as I don't have ministry now," said scam tainted Minister Ajit Pawar to India Satire correspondent. Ajit Pawar, Maharashtra deputy chief minister, resigned on Tuesday following allegations of irregularities in clearing irrigation projects in the state. He said "I am a by default a social worker and never remain alive without social work. Social work is in my genes. Even in my dreams I work for society. You would not believe yesterday in my dreams I saw myself collecting garbage, cleaning bathroom and sweeping clean & dry for socially ignored old age people. Therefore, I thought I should do all these thankless things." He confirmed that he applied for a job in an unknown Old-Age Home of Mumbai which is actually scrutinizing his C.V. and will offer a job on Rs 2000 per month scale as soon as he fits for the job of sweeper. He also asked few other ministers from different states to join such work so that they also can continue to work in favor of the society.